Hayes’ Terin Kinsway (5) puts up a shot between Dublin Scioto’s Jacob Jones (1) and Dapreis Owens during the first half of Friday’s OCC showdown in Delaware. Delaware Hayes boys basketball coach Jordan Blackburn told his team to stay the course after visiting Dublin Scioto rang up seven three-pointers in the first half. And they didn’t. 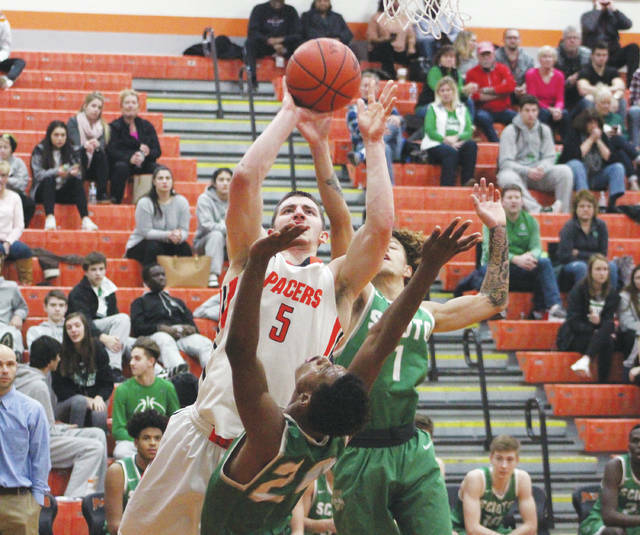 The Pacers held Scioto to just two in the second half in a 50-41 OCC-Cardinal victory Friday night in Delaware. Scioto beat them in all four games since the two became members of the Cardinal Division before last season. One of those wins ended Delaware’s season in the tournament. Sophomore Benjamin Lombardo came off the bench and knocked down three of those seven first half treys and scored 13 points to lead the Irish to a 25-20 lead at the break. Kinsway scored the first nine points of the second half and gave Delaware a 29-28 lead on a made free throw to complete a three-point play. Griggs followed with a steal and layup on the next possession to push the lead to three. Scioto took a brief one-point lead in the fourth on a Dapreis Owens layup with 5:50 left off a Jacob Jones steal. But, Griggs sank a pair of free throws on the next possession to give the Pacers (7-9, 5-4) the lead for good at 37-36 with 5:44 left. Still, Delaware hadn’t led by more than a possession since early in the first until Paul Burris drove the left side and kicked out to Addison Harvey in the corner for a three-pointer to push it to six with 4:35 left. Scioto answered on the next possession, however. Noah Brechbuhler kicked to Lombardo in the left corner for his only points of the second half. Griggs scored a pair of baskets sandwiched around a Burris basket from the left elbow during a 7-0 run to push it to 49-39. Delaware’s defense was particularly stingy at the start of each quarter holding Scioto off the scoreboard for the first 1:55 of the first quarter, 3:29 of the second, 3:20 of the third and 46 seconds of the fourth quarter. It didn’t pay off in the first half as the Irish (8-7, 3-5) outscored Delaware 13-7 after the Pacers opened 7-3. Scioto knocked down four threes in the opening quarter, including a pair from Brechbuhler, who finished with 10 points. Delaware is off until Friday when it travels to Hilliard Bradley in league action. Tip is set for 7:30 p.m.